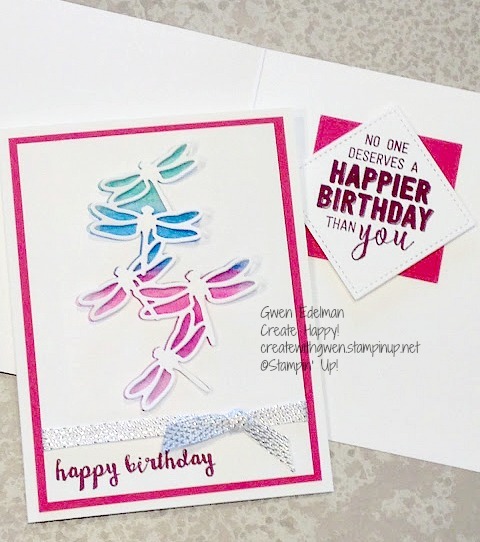 Create with Gwen: Stitched Dragonfly Dreams Bundle Class! 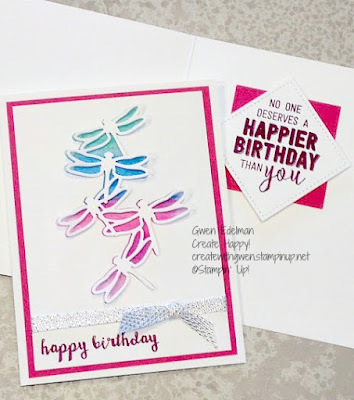 Stitched Dragonfly Dreams Bundle Class! Our weather in PA has been going back and forth from 70 degrees to 40 degrees every few days! Can't wait til it stays around 70! I'm hoping for no more snow, getting ready for spring, and playing with Dragonflies! March Class will feature Stampin' Up! 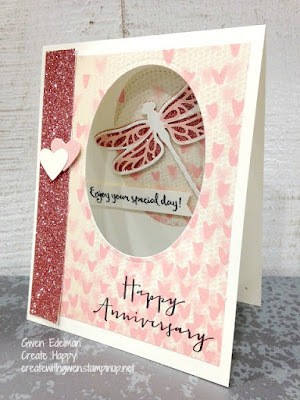 Dragonfly Dreams Bundle from the Occasions Catalog enhanced by the Stitched Shapes Framelits Dies! So let's Play - attend live in the Create Happy Stampin Studio or received finished cards in the mail! *We also stamp our envelopes so they look pretty too! * Must RSVP with payment or have placed your online order by Tues, March 7. Note: Create Happy Stamp Club Members will be creating at least 2 cards, from this class, at club March 7. If you would like to also attend this class, please enjoy $5 off! ***Can’t make it to the class in person? Purchase the bundle using the same Host Code and receive ALL the projects we create at class - Free - and a little something extra just because! I thoroughly enjoyed create these cards and you will too. The card on the far right in pic at top of this post, was created by Vanessa Webb from Australia. Wait til you see that one in person! Hope to see ya soon! Have a wonderful day, and remember to Create and share YOUR Happy! Get Club and Class details again on my events page HERE! Occasions Catalog and Sale-a-bration Flyer has a plethora (love that word!) of awesome new products and free goodies! Check them out HERE!